You guys were incredible! Thank you so much for an excellent performance at our wedding. Guests were raving about you all night. We’d only wish we lived up in RI so that we could see you perform at other public venues. I think we may have increased your following because our guests indicated they wanted to see you guys again. Thanks again for making our wedding such a great time. Many people have told us that they thought the band was fantastic. We got our candid pictures back and I’m sending you some reprints of some cute ones of Brass Force. Hope you and the rest of the band enjoy them. We want to sincerely thank you for an excellent job done for our wedding at Astor’s on July 1. From the first song you played up to the last dance, we were impressed with your performance. 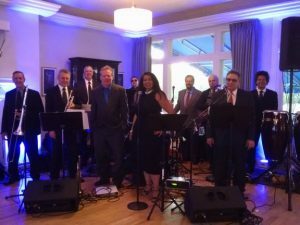 All of our guests had a wonderful time and continue to ask about you guys – our band!! Thanks you again for adding to the beauty & joy of our day. You guys were tremendous! Our guests raved about the song list and the quality in which they were played. We hope to catch your band playing out soon. We are looking forward to seeing you all again. Please except my sincerest apologies at this very late card. I cannot thank you enough for the incredible show you put on during our wedding reception at the Popponesset Inn back in October! From the moment my husband (then fiancee’) Mike and I saw you guys play at a bar in R.I. back in late 2003, we knew you were the band we wanted at our wedding. You guys seriously ROCK! We’d like to thank you for being so kind and so professional along the way. You made a bride’s hectic life a lot easier and for that, I am extremely grateful! Thank you! You all received so many compliments from so many guests! You know you’re doing a great job when even the “old folks” make mention of how “cool” the band is! Ha! Again, we are so thankful for the awesome show you put on for us back in October! We wish you the best of luck in the new year! Look forward to seeing you play somewhere soon!! Dear Brass Force…thank you wonderful….fabulous…..and much much more……you could be New York New York……Katie & Nick chose well. Their friends…our friends…David and I had a great time. And, importantly….you listen……loved the easy listening music during dinner….from an aging parent…..from the bottom of our heart and ears….thank you. ….and I love the way you play Georgia On My Mind….. Thanks you for contributing to our special day. The band sounded great and we all had a wonderful time. First of all, please let me apologize for such a delay in getting this note to you. Words cannot express the appreciation Josh and I have to you all for helping to make our wedding better and more fun than we ever could have imagined! Thank you for taking the time to learn “Wave on Wave” for our first dance. We were both so happy with how great it turned out! From the music at the cocktail reception to the rest of the evening in the tent, you did a FABULOUS job at providing music for our reception. We could not be more pleased with how our wedding turned out, and Brass Force played an integral role in that. Our main goal was for everyone to have fun and enjoy the party. And because of you all, that goal was definitely accomplished! We received numerous comments from friends and family on how great the band was. You were a pleasure to work with throughout the process, and you are true professionals. I will definitely recommend you to everyone in New England looking for a band. Thank you for everything, and hopefully we will run into in the future! 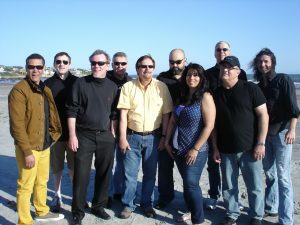 I want to thank all of you so much for your wonderful performance at our wedding June 12th at the Glen Manor House. The only thing that broke my heart was not having enough time to dance. We’re just going to have to go into town this summer when you’re laying to make up for the lost dances. When I was originally looking for a band for our wedding I knew I didn’t want a typical “wedding band”. I wanted WOW! I wanted great music. Well after a lot of disappointing tapes, videos, and auditions I was ready to give up on great. Then I found Brass Force I’m so glad I never lowered my standards. Thanks again for the terrific music and professionalism that went along with it! We wanted to thank you so much for the fantastic job you did at our wedding August 1st. Everyone had a wonderful time, and we got so many compliments and inquiries as to where we found the band. We couldn’t have asked any more – you had the crowd dancing the entire night!! Having you there really made the difference in our wedding celebration. We hope you have many more successful events, no doubt you will! Thank you again for your hard work and outstanding playing. Hopefully we didn’t make it too difficult for you – and if you ever need a reference – please don’t hesitate to give us a call. We are recommending you to all our friends!! We hope to see you again. We’ll keep updated via your website and try to catch you some time in Providence!! Take care and best of luck in the future. Thanks so much for a wonderful selection of music. Just wanted to thank you & Brass Force for an amazing performance at our wedding. You came with multiple referrals and now we know why! We are really enjoying watching our guests dance the night away on our video. Enjoy the Holidays! JUST A QUICK NOTE TO SAY HOW MUCH WE ENJOYED BRASS FORCE AT OUR WEDDING. YOU REALLY MADE IT A SUCCESS – AND WHEN YOU CAME THROUGH W/ MACEO PARKER, WELL, WE WERE TRULY PSYCHED. Thanks you so much for being the entertainment at Katherine and Rol’s wedding. The music was great, everyone had a good time, and you were able to get all the guests out on the dance floor. What a great job. We have had loads of compliments on your band. We will definitely recommend you to other people. We just wanted to say thanks for making our wedding reception such a wonderful time!! We had a great night and so did our guests. We are very pleased to have had you play…and we will continue to recommend you for future events, Thanks again…I’m sure we’ll be seeing you at Christies soon! We hear you’ll be back soon – Can’t Wait! Happy New Year! Thanks for helping us show our guests such a great time at our wedding! Eddie’s mom said “that was not just a wedding, that was a party!” and the photo of her mom on the dance floor twirling her jacket over her head is proof. There were so many people dancing who normally hardly move! We promised everyone it would be the best party ever, and that’s what it was! We will always tell anyone who is looking for a band to call you, there’s no point in calling anyone else. Thanks again and we hope to have an opportunity to work with you again soon.